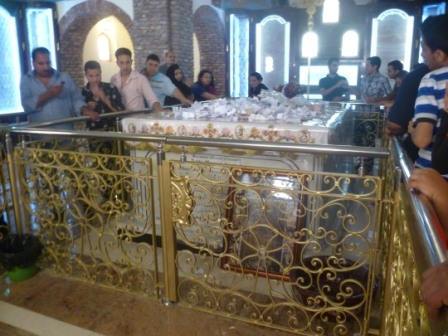 Yesterday, in a third attempt, I was able to see the final resting place of Pope Shenouda. All efforts were arranged by my friend Rashad, who I met through studies at a Coptic Orthodox theological institute, and who regularly organizes group trips to the various monasteries of Egypt. One such ordinary trip was to the Fayyoum region, where I had a daddy-daughter date with my firstborn. The first attempt was canceled before it started. Rashad realized half the Coptic world was on its way to St. Bishoy Monastery in Wadi Natrun where Pope Shenouda was interred. Though he called around to solicit fellow pilgrims, he called it off later that same day. 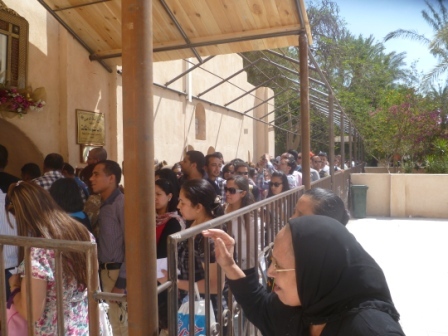 The second attempt was a week later, and my second-born and I made our way to Wadi Natrun before realizing the other half of the Coptic world preceded us. 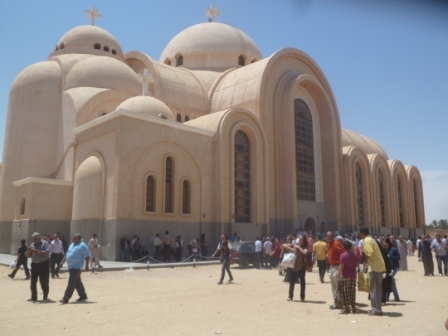 Rashad wavered in continuing on hearing reports of the great traffic; when he heard of several deaths as Copts crushed against each other, he redirected us to the nearby Makarious Monastery instead. 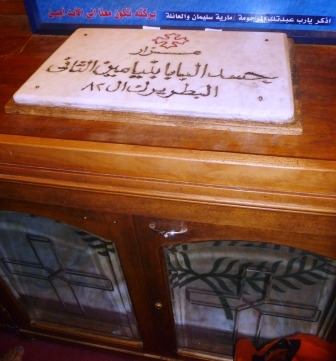 I had hoped to write comparing the shrine of Shenouda to that of his predecessor Pope Kyrillos, which I visited just before Shenouda’s death. Instead, I simply reflected on the effort to do so, focusing also on the shrine of the martyrs from the 2010 bombing in an Alexandrian church. The third attempt succeeded. The trip was relatively uneventful, save for a flat tire on the way. Once again the monastery was packed – the visiting communion attendees filled half of the massive cathedral built on its grounds. Afterwards we delayed and had breakfast in the monastery cafeteria, allowing everyone else to jostle their way into the shrine. An hour later, we were able to walk through briskly. Briskly it was. There were attendants inside asking people to keep to their orderly lines and move quickly through the building. 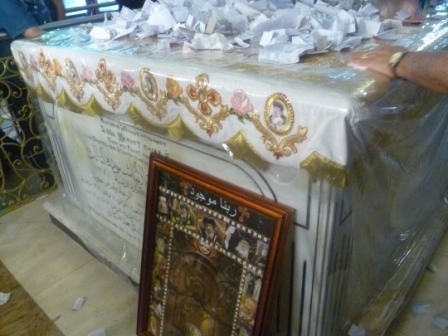 People threw prayers written on scraps of paper onto Pope Shenouda’s above-ground tomb, seeking his intercession. As they circled they touched their hands to the marble, seeking his blessing. If either were to be had, they were had quickly. Within two minutes we were outside again. By now the crowds were low, and I returned for a second circumambulation in order to take the following video. Click here for the four minute tour, with accompanying commentary. It was both surprising and impressive to see the guardrails and organization at the pope’s tomb. Thinking back to the news of the deaths by crushing, my curiosity wondered if they were present that day. Unfortunately, I failed to discover an answer. Either way seems possible – the area was very tightly constructed. 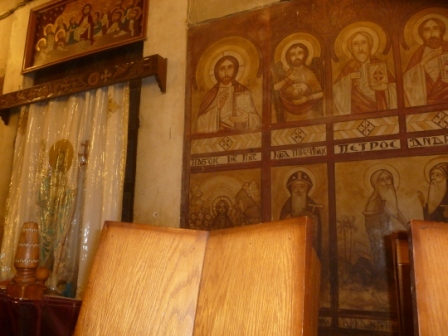 St. Bishoy Monastery was Pope Shenouda’s choice for his remains. In 1981 he was banished here by President Sadat. After President Mubarak restored him to the papal throne in 1985, he established a practice of returning regularly for prayer and contemplation. To close, here are a few pictures of the monastery, including other shrines housed therein. Inside the ancient church of the monastery, which was founded in the 4th Century. These icons likely date back a few centuries. 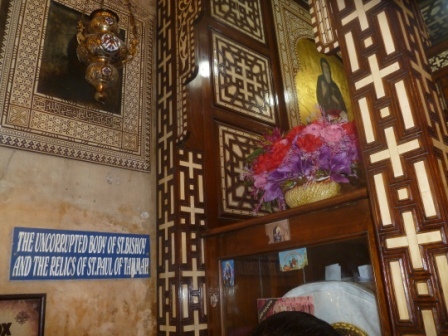 The shrine of St. Bishoy, which the sign claims contains his uncorrupted remains. The remains of Pope Benjamin the 8th, 82nd patriarch of the church. With Rashad, whose living remains are a frequent source of blessing. My husband used to take our kids, one at a time, when they were little! Every time I read your blog I’m taken back in time in a wonderful way. This looks pretty amazing. The monks used to say to my husband ‘You’re really orthodox, you just don’t know it!” Great post and great pictures accompanying. Thanks Marilyn, we’re glad we can conjure good memories. I love the monks, too.